This article was written because I was not completely satisfied with the sharpness of my photos. Most shots of people and places are of excellent overall quality. But, many of my attempts at wildlife (telephoto) and flowers (macro) have been less sharp than I would like. I have tried almost every standard photography trick that I can find including attention to depth of field, auto focus, manual focus, tripods, and anti-shock mirror settings. I have tried almost every Photoshop technique that I can find such as unsharpen mask(s), levels, and contrast. These do help when needed, but there is no "one size fits all" technique. I’ve fiddled with the Nikon in-camera sharpening as well, but I find that it frequently exaggerates noise and it is difficult to predict how much to use. The bottom line is that I use ASF GEM or PS USM most often, but only where needed. 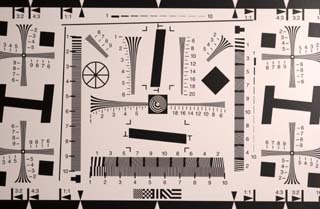 In my research, I came across the idea of shooting pictures of a standard convergence chart to assess image clarity. I decided to do this with several lenses to rule out any issues with the glass. My first tests with a "home made" convergence chart target printed on a high quality laser printer were inconclusive because the target image quality was less than the D1X image quality. I finally bit the bullet and purchased an ISO-12233 convergence test target from Edmund Industrial Optics. The target is approximately 8x14 inches. It consists of horizontal, vertical, and angular lines and patterns of various sizes. 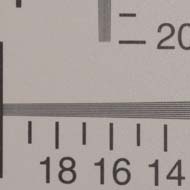 The numbers refer to target groups and are basically identified as line widths per picture height. Whatever, I measured the group 1 area at 2mm wide lines. Thus, group 20 is .1mm wide. I expected group 1 to be 1mm since this is a 1X chart. Just some facts. 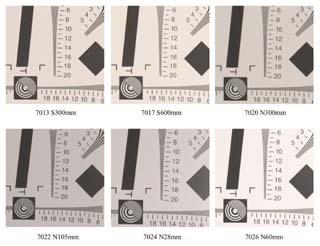 The objective of the test was to determine where on the chart the resolution starts to degrade for each of my lenses. The evaluation is subjective, but at least I can compare apples to apples. I set the test target on a stand and setup a studio flash. Since there were a variety of focal lengths, I moved the camera to get approximately the same image size in each shot. The shooting distances varied from four to 24 feet. The target and flash were never moved. These were all shot with my Nikon D1X in uncompressed raw (NEF) mode. The ISO was at 125, anti-shock mirror on, remote shutter, and white balance set to flash. All were shot with auto focus and exposure 1/250 at F11. Each of the images was opened at 3008 x 1960 (Nikon D1X default) with no exposure overrides and no sharpening or other adjustments. Each image was cropped to 750 x 750 pixels from the same anchor point. These were all then combined into one Photoshop image and converted into a "maximum quality" JPG file. There are slight variations in brightness with the different lens configurations. You may also notice some small reflections from the flash. I did not use a soft box or multiple lights and the test target was printed on photographic semi-gloss paper instead of matte finish. These image files are all at one-to-one pixels (as shot) with no re-sizing or other digital adjustments. Click on the images below for the full size JPGs. 1.8MB Consolidated shots from multiple lenses. Best of breed 60mm lens. 1MB Full sized test target DSC_7026. Just for grins, a real close-up shot. I can't see anywhere near this detail with the naked eye. 530KB DSC_7030 60mm Macro from 12 inches. With this good test target, I am able to discern some difference in the sharpness among these lenses. What I looked for was the point at which I could no longer see clean lines vertically and horizontally at 1-1 pixels. Horizontal resolution was observed in the vertical convergence bars. Vertical resolution was observed in the horizontal convergence bars. Since the D1X CCD has more horizontal sensors than vertical, it is no suprise that the horizontal resolution is better. An interesting point is that I cannot discern resolutions above 16 vertically or horizontally viewing the target with the naked eyeball. The D1X came close to this from 25 feet away. In my opinion, the Sigma 120-300mm and Nikon 60mm lenses did the best. Naturally, these were the newest and most expensive of the four. You should be able to see what looks like a moiré pattern in the circle in all shots except the one at 28mm. Make sure that you evaluate this at 1-1 pixels or you may see a moiré pattern from interpolation on the screen. This circle is dead center in the target and should be at the "sweet spot" of the lens. An interesting observation is that this is less pronounced than I have seen in test images from other cameras. I believe this is actually due to chromatic aberrations. You can also see some more chromatic artifacts elsewhere as the resolution limits are being approached. Since this is a black and white target, you should expect no discernable colors. This chromatic aberration is defined as an artifact of the lens quality that allows the light rays of different colors to focus at different planes. This results in images being fringed or haloed with extraneous color. The objective of this effort was to enhance my confidence in my equipment and to determine if any of my photographic techniques are flawed. I don't think there is anything wrong any of my lenses or the D1X. I was suprised to see that the exterme lenses (telephoto and macro) produced the best results. I can't blame them for fuzzy shots anymore. I do think that I need to pay attention to my photographic techniques. I will try to avoid shooting at the extreme limits of the lens apertures in the future. Happy shooting. If you have any insight, comments, or suggestions, I would welcome your input. Please send me an Email. Yesterday I was shooting shots of the moon for backgrounds. I ran into another observation that affects sharpness, so I thought I would post it here. I shot multiple images, all with the basic setup. That is Sigma 120-300mm with 2X TC, tripod, and remote shutter. This time, I did not use the anti-shock mirror custom setting. The basic exposure was ISO 125, 1/8 sec at F16. Most of the shots were with auto focus, but I decided to shoot a few with manual focus before I quit. That led to a revelation. After looking closely at all of the shots (about 20) I noticed that the AF shots were never quite as crisp as that last shot with manual focus. The only other manual focus shot was a little soft but that is strictly my lack of skill and old tired eyes. The revelation was that all of the auto focus shots had a slight amount of fuzziness due to camera vibration. You can see this in the image below, especially at the lower edge of the moon. The anti-shock mirror setting would have given a little delay that eliminates this vibration. But, I did not use it for any of the shots. The conclusion I came to is that the vibration was more from the lens movement during auto focus than from the mirror itself. This makes sense since the lens is 13” long and weighs 5.8 pounds. The difference is not my ability to focus, it is camera vibration. So, if you are shooting with a long and heavy lens and relatively slow shutter speeds, I highly recommend the anti-shock mirror setting. Of course, there is also the option of using vibration reduction technology in long telephoto lenses. Moon over Dallas on August 4th, 2003 at one-one pixels.